ALLEGRA BOVERMAN/Staff photo. 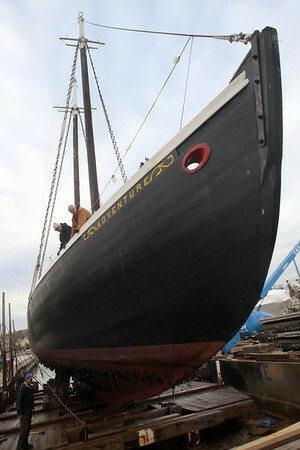 Gloucester: The Schooner Adventure was hauled out of the water on Tuesday afternoon at Gloucester Marine Railways so it can have diagnostic and repair work done throughout the boat. On deck are Bill Holmes, the shipskeeper and project manager, front, and Bruce Slifer, a volunteer, behind him. Railways Foreman Ed Wayman oversees things from below left.